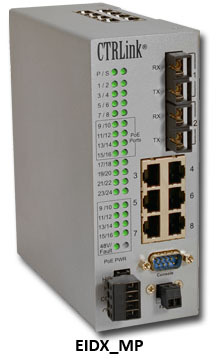 May 2013 – Contemporary Controls has released the EIDX_MP which has multiple ports that support Power-over-Ethernet (PoE), providing data and power over one cable. The EIDX_MP joins the newly released Automation Switch Series which provides larger systems with management functionality in situations where extended temperatures of -40° C to +75° C are expected. The series is intended for those who need to push the limit of Ethernet connectivity and require high port density with minimal panel space. The EIDX_MP has a fixed width of 62 mm. The units offer 16 or 24 ports with copper and fiber/copper combinations. Ports 9 through 16 (located on the bottom of the unit) support Power-over-Ethernet (PoE), providing data and power over one cable. The unit acts as power source equipment (PSE) - supplying up to 15.4 W per port for IEEE 802.3af-compliant powered devices (PD). "PoE eliminates the need for additional power supplies for Ethernet-enabled devices placed in challenging locations - such as wireless access points or IP cameras on a ceiling or outdoors," said Joe Stasiek, Sales Manager at Contemporary Controls. In addition to the conventional features standard in Plug-and-Play switches, the EIDX_MP Series offers many important managed-switch benefits. These benefits includes IGMP snooping and IGMP query, RapidRing®, VLAN, Quality of Service (QoS), port mirroring, rate limiting, trunking, port security, the Simple Network Management Protocol (SNMP), and the Rapid Spanning Tree Protocol (RSTP). Configure the unit by web browser via any Ethernet port - or in terminal mode via the local console port. Using either of these methods, port parameters, feature configuration and device status can be monitored and/or modified. A configurable relay is present for attaching to fault-monitoring equipment. To learn more, visit the Automation Switch Series Product Page.